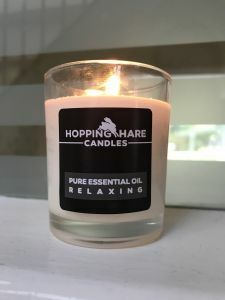 I met Claire of Hopping Hare Candles at a small business fair in Leamington Spa when I snapped up one of her gorgeous Relaxing candles with a delicate lavender scent that now floats through our home. Since then I have had the absolute pleasure of learning more about Claire and her sister Justine and they have very kindly gifted some candles to me to try out. 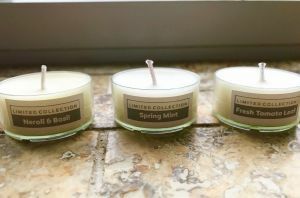 Most recently they sent me three of their tealight testers (available for £1 each) for their sparkling Spring Collection. These are totally unique and definitely grab the attention with uplifting fresh scents that are a perfect companion to any kitchen. I was keen to find out more about not just these candles which I know have been fun for them to create, but about the people behind the business too. My background is in marketing. I have over 30 years experience in all forms of marketing and working in big advertising agencies, and scarily half of that experience was before the dominance of the internet! I’ve been lucky in that I have worked on many global brands as well as lots of small emerging businesses, covering design, branding, advertising and online. Justine has been in sales and customer facing roles for around 20 years now. Our combined experience has meant that we have been able to push our company forward very quickly, and that we could come to the marketplace as a very well formed professional company last October. The things that most small businesses struggle with were easier for us due to our experience. We share a common desire to make really high quality products. If we do a job, we like to do it properly. We only make things we would buy and use ourselves. Why did you decide to start up a business? We had both had a bad August in one way or another, so one of our friends decided that he was going to teach us how to make candles as a way to chill out and a have a fun day. He is a master chandler and used to have his own candle business before he turned website developer. He taught us the basics, more what not to do than what to actually do. He also taught us the hard way as his thought process was that if we learned our craft using the most difficult wax and with essential oils then we’d be OK with the easier waxes. We thoroughly enjoyed the experience, so we did more training and found we had a good working partnership. I blend fragrances and my sister is good at pouring and production. Our hairdressers then gave us a fantastic opportunity to test our 16 initial blends out on their customers at an event in their salon, so we took our first batches and nervously presented them to over 150 people in one evening. We asked them to give us honest feedback – positive and negative – as we wanted to end up with a range of around 10 blends. However, life doesn’t work like that so we came away still with all 16 and have then added more to the range since then. We wanted something memorable that had some basis in reality, we wanted a story for our company that was real. A theme that runs through the heart of Hopping Hare. We went through so many options, but nothing was meeting all of our wish list. My sister was admiring a hare printed tea towel in her friend’s kitchen, and they agreed most people love hares. So she came up with the idea of the name driving home, our surname is Hopper, which to be honest has been a source of much amusement over the years so we decided to turn it to our advantage for once and Hopping Hare was born in September 2017. So we are still a very new company, but our name helps people to remember us, which is brilliant. Do you design them all? Yes, we blend, we design all the packaging etc ourselves, and we do our own photography. It’s all home-made in some form or other. We have specific quality requirements for ingredients, we buy the best raw ingredients we can find, so our rapeseed wax is non GM. We are often asked why rapeseed and not soy – and we could say the environmental impact of rapeseed is not as drastic as soy but actually the reason we use it for our blends is because it burns best and lasts longest. As it is difficult to work with, we find less people use it, so it gives us a point of difference as well. The essential oils we buy are therapeutic grade oils so no additive nasties. We use natural wicks, cotton and cotton/linen mix in the main. We do look at trends and make a judgement call if we want to jump on a bandwagon or not and then see what we can source and how. We are constantly looking for ingredients to create new blends and sourcing those ingredients can decide if we make it or not. I usually have a few favourites, my first blend is always a favourite – which is Warming as I love Patchouli, I also love Oud and my favourite of our 5 ouds is Persian as it reminds me of Middle Eastern souks. My current favourite from our new Spring Collection is Spring Mint. It took me ages to get the blend right so it was a labour of love. Justine’s favourites also include Warming, she likes Oriental Oud and her current favourite from the new collection is Fresh Tomato Leaf. What’s been the biggest learning point since starting up Hopping Hare Candles? I suppose it is how you get people to buy from you online if they have never smelt your candles before. It is a problem that affects many small candle making businesses. It is why we launched our tealight service – we copied the idea of paint test pots, as we thought it was sort of the same issue. We sell our tealights for £1 then you get your money back if you like it and go on to buy the candle. And if it wasn’t quite your thing, then at least you have a tealight you can use or give to someone without the financial risk of buying a bigger candle that you don’t like, that’s just not good for anyone. Too many customers have been the victim of poor candles, where they either don’t smell when you burn them or they ‘tunnel’ leaving half the wax behind. Everyone we ever meet has a ’bad’ candle story to tell (usually from a high street retailer and rarely from a hand-made artisan candle). If a candle is cheap there is usually a reason for it. Oils are very expensive so if you buy a cheap candle it probably doesn’t have a lot of oil in it and therefore it probably won’t smell very much if at all when burning. The reason some candles smell when they are unlit is that the wick can draw oil up to the top of the candle, this is what you are smelling, but this then evaporates over time then as the candle burns there’s barely any oil left when the candle burns. We use a very high percentage of oil in our candles so that they are both very fragrant and burn for a long time. We are about to launch other products, but until they are perfect they are not let out of the office! Next is our range of diffusers and room sprays, followed in the summer by an essential oil based range of skin care basics. We are already trialling our soaps, bath melts and bath and shower bombs, and all is going well so far. We are using the same essential oils we use for our candles so we know they will smell fabulous! Is there anything else that you would like to tell my audience about you or Hopping Hare Candles? Candles do lose their fragrance so don’t keep them in a drawer or cupboard – burn them or by the time you get around to using them they may not be fragrant anymore. People may say ‘well you would say that, you are trying to sell candles’ but it is true, when we buy oils, there is an expiry date on the bottles. Candles should really come with any expiry date, but at the moment this is not part of the industry legislation. We personally make candles in small batches to keep them as fresh as possible. We can usually tell you when a batch has been made as well as we keep this information to ensure we are always selling a good quality product. The second thing we want to share is to burn your candle til the melted wax reaches the sides of the container, then it burns properly. It may look like it is turning to liquid but this is a good thing and showing you a good burn. It will harden again once you extinguish. We had a prime bad burner candidate in our mother, she would light a candle and then blow it out after 30 mins to ‘save’ it. Then wondered why she got tunnelling on all her candles. She has now seen the light and is evangelical about telling everyone how to burn them properly! Huge thank you to Claire and Justine for sharing this! It has certainly taught me a thing or two (or three) and made me understand why some of the inexpensive candles that I’ve picked up in the past smelt gorgeous up close but didn’t seem to share their scent when lit! And the Spring Collection tealight samples that I was sent? Spring Mint is beautifully uplifting, Fresh Tomato Leaf reminds me of running my hands down the tomato plants in an allotment or even the smell that comes from picking home grown tomatoes on our balcony. My favourite though, is Neroli & Basil. I absolutely adore the scent of basil, it takes me back to my university days and travelling to Italy, and the scent that even the small tealight gives off is delightful. It was hard to choose between them though, and incidentally my husband was more taken by the Fresh Tomato Leaf, so it really depends on individual preference. 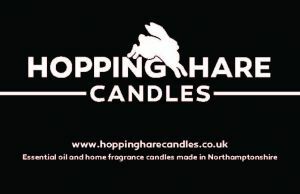 This is where the Hopping Hare Candles tealight service works so well to try out difference fragrances. I would highly recommend it to see and smell the high quality of these candles. 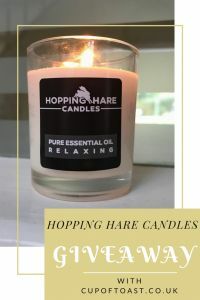 You don’t have to take my word for it though, because I have teamed up with Hopping Hare Candles to bring you a wonderful giveaway! That’s right, you could be in with a chance of winning one of their fabulous candles in a medium size which is either 30cl or a 20cl size for the Oud range. This giveaway is for any fragrance, so you could dip into their Spring Collection or go for something else entirely! All options for entry, along with terms and conditions, are below – good luck! They’re at a country show today, they’re fab! With regards to the competition, I’ve checked all the coding so it should be working fine. You do need to click through to enter though so that you are authorising the competition to link you up to your Twitter account for example. Hope that helps and good luck! Thanks for sharing about them! It can be tricky, although with a decent candle you don’t get the tunnelling that you get with others which definitely makes lighting them easier! They smell so nice don’t they? It’s always interesting to hear about local businesses – these candles look great! Thanks for joining in with #TriumphantTales, do come back Tuesday!